The world community recognizes asteroid hazard as one of existent problems of environment and space and it is necessary to carry out an estimation of a degree of a threat reality and an analysis of possible measures of a counteraction. Thus the degree of gravity of the asteroid hazard problem is examined over a wide range, from the estimation of a level of safety of spacecrafts to the search for asteroids threatening to all the civilization. The necessity of analysis of possible forecast measures and counteraction to asteroid hazard increases. 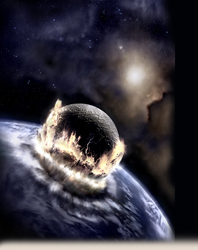 In many countries (USA, UK, Italy, Germany and others) programs of search, detection and cataloguing of potentially dangerous natural space objects are accepted and carried out by specialized observatories. In Russia the research being bound up with different aspects of asteroid hazard is realized in many institutes and other organizations. At present, the coordinated approach to the asteroid hazard problem is required and it is appropriate to work in the context of the complex program where the Federal Space Agency (Roskosmos) could act as the State customer and coordinator and the Ministry of Industry and Energy of the Russian Federation, the Ministry of Defence of the Russian Federation, EMERCOM of Russia and the Russian Academy of Sciences – as customers. With this purpose the Expert working group of the Space Council of the RAS on the problem of asteroid and comet hazard on September, 15th, 2006 has been formed. On March 31, 2011 according to the decision of the Space Council of the RAS (№ 10310-01) the expert group on asteroid and comet hazard problem and the one on space debris problem were joined and now work as parts of the Expert Group on Space Hazards.